The show was Jon’s idea. That’s what Mike Maier writes, first and foremost, about the annual Arbor Christmas Show on the event’s website, and it’s the first thing he says when asked about it. Philly needs an all-ages show space. TWOB Fest wants to make that happen. DIY punk’s openness, accessibility and ability to survive (and thrive) hinges upon the existence of the right mix of venues. For the most part, Philadelphia has just that. The scene here is so nurturing that just about anyone can start a band, write a few songs, practice them and eventually, play a show. That conduciveness can almost seem passé sometimes just because we’re so acclimated to it, but the reality is that it’s just not like that in most cities. It takes a lot of hard work, some clever maneuvering, and the right mix of personalities to save a subculture from stagnation. In Philadelphia, that means a plethora of non-traditional, not-exactly-legal venues. Pennsylvania’s draconian alcohol laws, along with operating costs that are almost universally prohibitive for broke punks, mean that the vast majority of all-ages punk shows here are happening off the grid in musty basements, dirty kitchens and cavernous lofts, which makes for a uniquely wonderful, but perhaps unsustainable experience. Think of last year’s first Kat Kat Phest as an accident that went almost as smoothly as the organizers could have asked for. Anderson started Kat Kat Records in order to help out friends’ bands and put out their records, so requests for help booking shows in the area were not uncommon. That’s why his friend Ruben Polo (also his band-mate in the local four-piece Secret Plot to Destroy the Entire Universe) started helping out with promoting events, which he also does for a living. For a last-minute festival with mostly touring bands on the bill, the two organizers couldn’t have imagined it would go so well, even selling out the show on the final day. So this weekend, DIY musicians and local music supporters will once again gather for Phest 2, which will span five days, feature eight all-ages shows and boast about 50 bands. The all-festival passes, a bargain at $22, were sold out by December 20. Saturday night’s show with local heroes Smoother and Marietta, as well as New York-based Lemuria headlining, was moved to the North Star Bar after selling out at The Fire. But tickets are still available for all eight shows, a la carte style, at the show’s Facebook event page, and they range from $3 to $10…so it’s still a lot of bang for your buck. Several bands associated with Kat Kat Records will also play this year’s Phest, including By Surprise, Hightide Hotel and Tyler Daniel Bean. But Anderson and Polo don’t make it a priority to put their own bands on the bill. Oregon natives Typhoon will play Johnny Brenda’s tonight. The eleven piece outfit released their fourth studio album White Lighter back in August. The band successfully manages to offset their dark lyrics (which reflect lead singer, Kyle Morton’s childhood struggle with Lyme Disease) with pleasant alt-folk, choir-pop soundscapes. Tickets for the event can be found at Johnny Brenda’s website. For fans of PhilaMOCA‘s music-and-film Tuesday Tune-Out series, any month with five Tuesdays is extra awesome, allowing the curators to stretch out for an additional week and dig that much deeper into their field of expertise. This October, the venue brought on the folks from WKDU, Drexel University’s non-commercial free-form student station, to curate the lineup, and it’s a fantastic cross-section of the city’s DIY music scene. I caught up with program director Maeve Walker over email to get a preview of what’s in store this month. All shows are all ages, begin at 7:30 p.m. and are $5 at the door. For this month, all films are TBA. World Cafe Live welcomes Blackalicious tonight. Originally from the West Coast, the hip hop duo brings their quirky, eccentric, contemporary rap craft to the stages of the East Coast. Check for more information or tickets for tonight’s 8 p.m. show here. 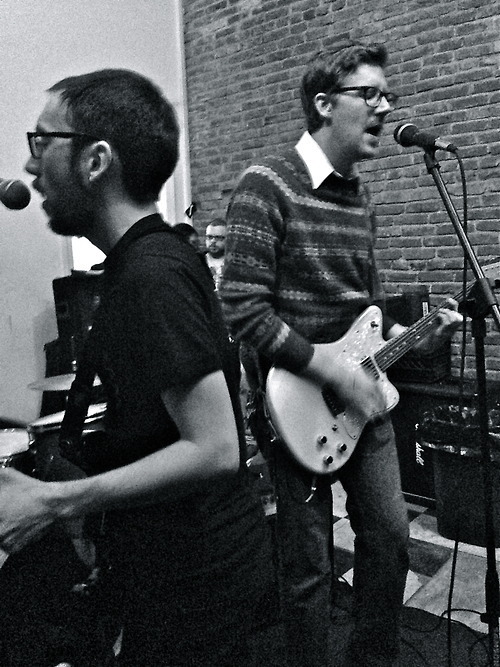 South Jersey punks By Surprise make it their goal to play for fun over progress. The group rarely performs live shows, and have been gradually releasing music over the last seven years (recently on Topshelf Records). Yesterday, Switchboard Sessions released some acoustic songs they recorded with the band over a telephone. The acoustic versions of the songs from the group’s EP Criteria really show By Surprise in a new light. Instead of drums, bass guitar and vocals, this set is a fuzzy mix of just two acoustic guitars and vocals. But what the songs lose in electrified energy, the band regains with raw sound of just words and simple acoustic riffs. The four songs seems to take on a Daniel Johnston honesty in this session. Check out a few of the songs below and download the full session from Switchboard, and catch a rare appearance from the band at The Fire ]on June 28th.